If you’re head-over-heels for our Sweet and Spicy Pepper Relish (you’re not alone! ), then these sugar snap peas are the obvious next step. But don’t worry if you haven’t experienced the life-changing condiment that is our beloved Pepper Relish … we’ve got an easy alternative for ya … read on! But that Pepper Relish. Let me swoon for a moment. Oh my. It just won’t release its grip on our hearts. True story: last weekend, Scott and Ty actually had a lively debate about whether there was anything that wouldn’t taste good with that Pepper Relish … and they decided that even chocolate ice cream would probably work out. I kid you not. It’s.That.Good. So if you’re like us, and you can’t stop loving that magical Pepper Relish … and (also like us) you’re a huge fan of super-fast side dishes (hey hey there, 5-Minute Easy Rice and Beans), this is one recipe you definitely need in your life. I mean, what’s not to love here? You Can Make These Ahead! Since you really only need about 5 minutes to toss this recipe together, it might not seem worth noting that these rewarm so nicely. But I often need to have little meals ready for busy teenagers at all sorts of random times, so it’s good to have food in the fridge that rewarms in a jiffy, whenever a hungry teenager roams nearby. 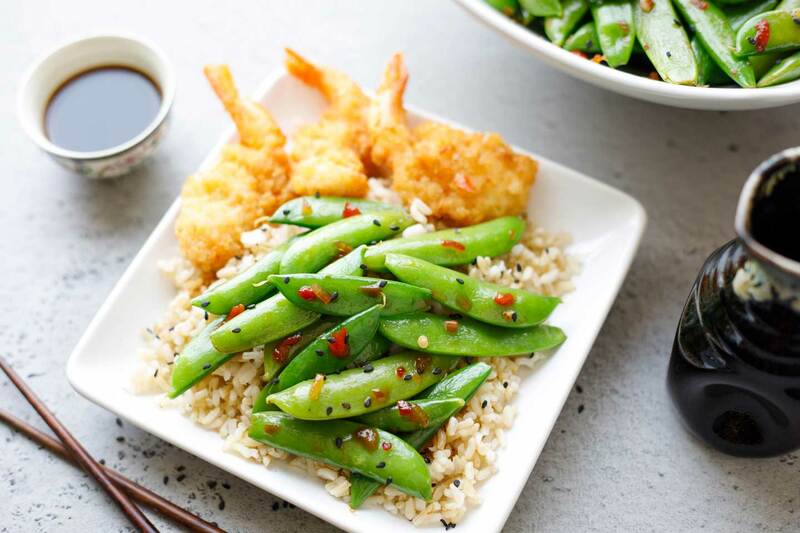 These sugar snap peas will hang out happily in your refrigerator, waiting until you need them throughout the week – perfect as part of a meal prep plan. Although … ahem … I may or may not have also snagged some straight from the fridge for a quick snack. 😉 They’re awesome cold, too. 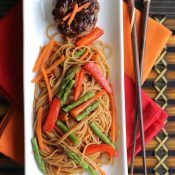 • Want a bit more umami from the soy sauce? Ok – stir in a few extra drops. • Wish it was a little spicier? 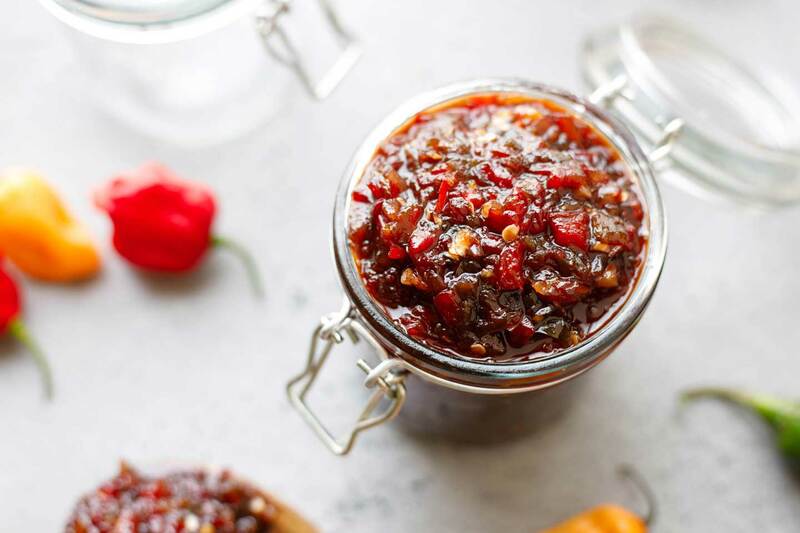 Easy – just add a bit more Pepper Relish, chili garlic paste, or even a dash of sriracha (which is one of the spicy ingredients in our Pepper Relish recipe). One note about the spiciness, though, while we’re at it. I definitely recommend starting with just a little Pepper Relish (or chili garlic paste) as you make this the first time. Honestly, I’m often surprised how much additional spicy Pepper Relish I end up adding … tasting … and then adding even more. 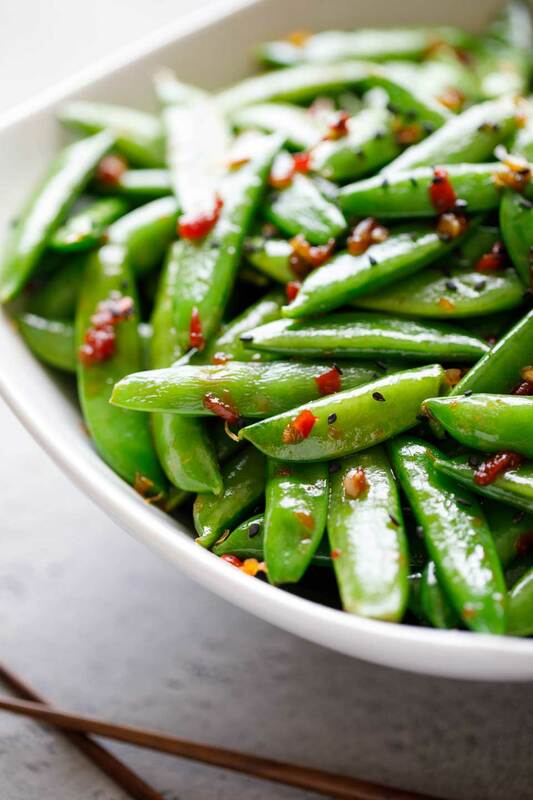 With the sweetness of the sugar snap peas, and especially if you’re serving this side dish along with something neutral-tasting like rice, you may be surprised, too, at how much spicy Pepper Relish you’ll want to add (especially if you made our milder, less-spicy version of the Pepper Relish recipe). But with spicy things, it’s always a good idea to start slowly and add a little at a time so you don’t go too far. • Wanna try a different topper? Ok! Be fearless! I think this recipe is really pretty with some black sesame seeds thrown on top. But, depending on what main dish you’re pairing it with, feel free to try something a little different … maybe toasted, sliced almonds. Those sesame seeds are just for looks anyway, so feel free to skip ’em or swap ’em! What If You Don’t Have Any Pepper Relish (GASP)? Don’t panic. I mean … maybe you should feel just a little panicky that you’re missing out on a kinda-life-changing obsession. And probably you should make a mental note to whip up some of our Pepper Relish really soon. But this is definitely not a reason for true, breathing-into-a-paper-bag panic. 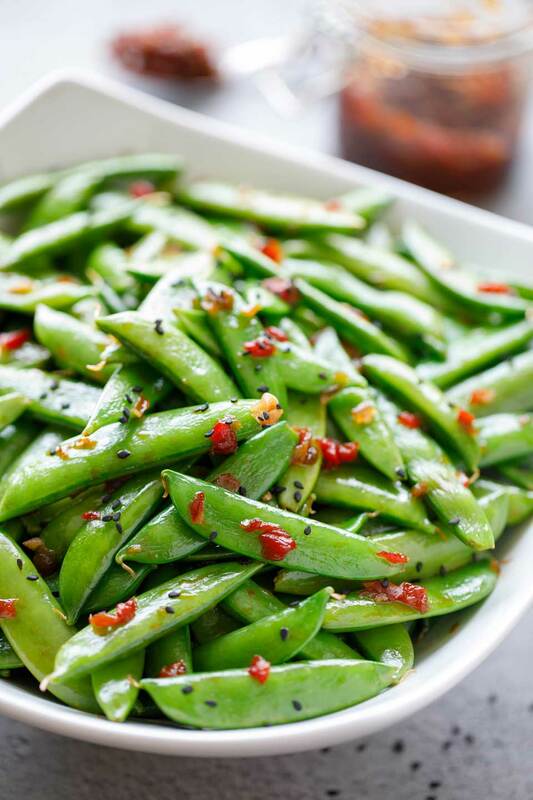 Originally, I wasn’t even going to make these sugar snap peas with Pepper Relish, actually. 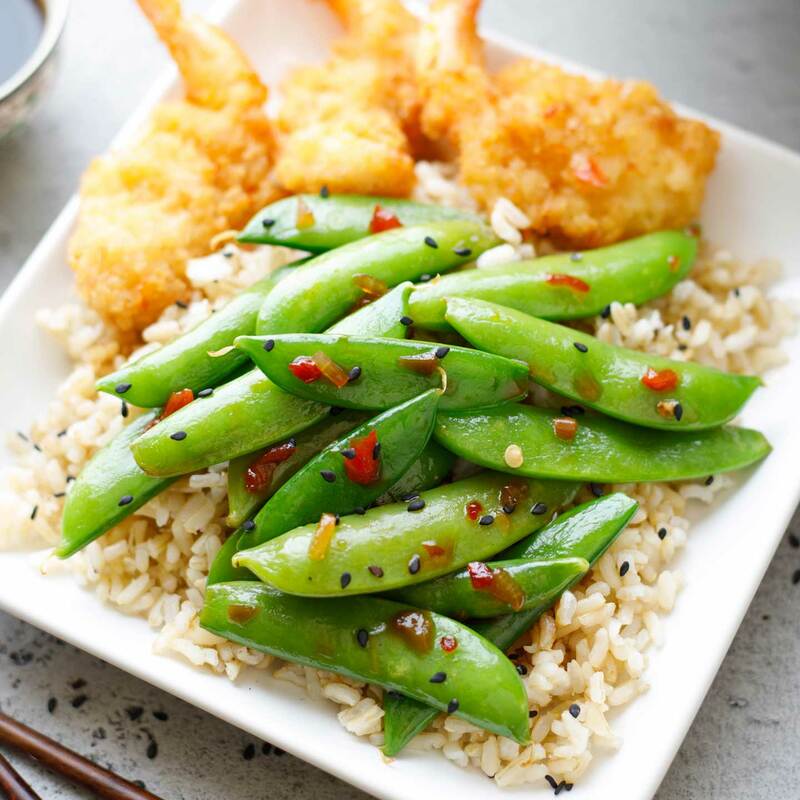 Ty and I were having a mommy-son dinner at home, and we needed to toss together some sort of Asian-inspired side dish to go with our coconut shrimp and rice. I was just reaching into the fridge for some Asian hot sauce – hmmmmm … maybe some Thai chili garlic paste? – when Ty said No! Use the Pepper Relish! That Pepper Relish works miracles here, and elevates a few simple ingredients into something you’ll want to make again and again. Plus, since we now have a freezer stocked with individual little baggies of Pepper Relish, all ready and waiting for us, this side dish is a total snap to pull off. But for those of you who don’t have any Pepper Relish stashed away, you can use my original idea for chili garlic paste as a quick work-around (you know … until you get some of your own Pepper Relish stashed in the freezer). Stir those two things together, and you’ve instantly created an easy Pepper Relish substitute in moments! So, will this work-around substitution taste just exactly like our beloved Pepper Relish? Well, no. Not exactly. The flavors aren’t quite as deep or complex. But that’s ok – it’ll still be good, and it’ll be your creation … and your sugar snap peas will be on the table in 5 minutes, which was really the whole point to begin with, right? How Do I Cook The Sugar Snap Peas? As directed on the recipe card, we like to grab those (super-easy!) fresh, steam-in-bag peas that are now so common in the produce section of most grocery stores. You cook the peas right in their bag, for about 2 or 3 minutes in the microwave, and you can even start measuring the rest of the ingredients while they’re cooking. FAST. Just how I like it! But, if you have gorgeous, fresh sugar snaps from your garden or the farm market, you could cook those up, too, any way you want. Steam them, stir fry them – whatever you prefer and have time to do. An important note, though: for this recipe, I do recommend that you don’t overcook the peas. 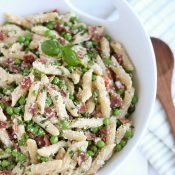 Just our personal preference, but my family definitely prefers the flavor and texture of the peas in this recipe if they’re still fairly crisp and sweet, instead of heading into that mushy stage where they taste like … well, like mushy, overcooked peas. 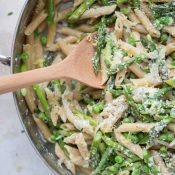 This is a simple recipe that really lets the flavor of the peas shine, so cook time can make a notable difference in the final dish. Or, one of our favorite (and really easy) ways to enjoy these is simply with some store-bought, baked shrimp and brown rice, just like Ty and I did the first night we tossed this little recipe together. The flavorful sugar snap peas are the perfect complement to the shrimp, and they give that plain rice a nice little kick in the pants. It’s really lovely together. As a side dish, this recipe kinda has it all going for it: big flavor, easy prep, and lots of terrific veggie nutrition. Give it a try, and I’ll just bet it becomes a go-to for you … just like it did for us! Enjoy! Cook Time 2.5 - 3 min. 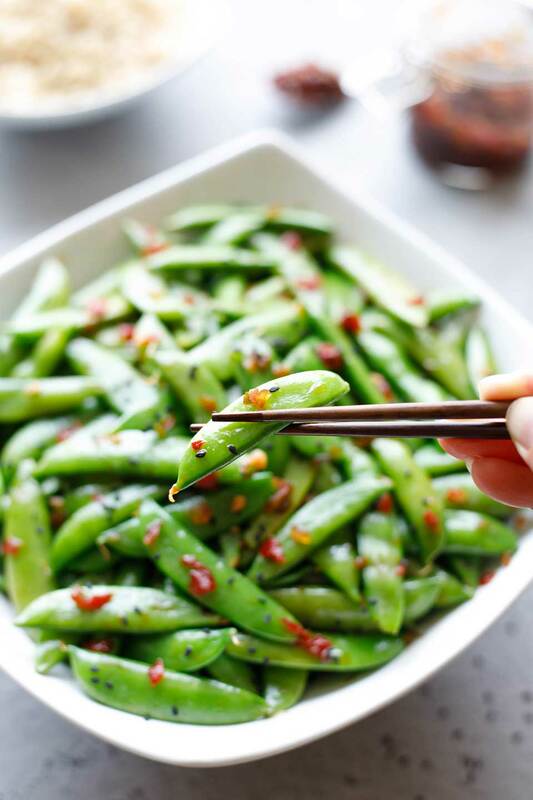 Toss hot, cooked sugar snap peas with soy sauce and sesame oil. (If using steam-in-bag peas, be sure to drain off any water that may be in the cooking bag, so it doesn't dilute your sauce mixture). Add Pepper Relish (or jelly / chili garlic paste substitution) to taste. We find that 2 teaspoons is a good starting amount but we often add more – you may want more or less depending on how spicy your batch of Pepper Relish turned out, and on how spicy you like your food. Once you're done adding Pepper Relish (tasting and possibly adding a bit more), and adjusting the other flavors, add a pinch of salt, only if needed. Garnish with black sesame seeds, if desired. They don't add much flavor, but they look really pretty. When serving, be sure to scoop all the way to the bottom of the serving bowl to get some of the flavorful sauce along with each serving of peas. Cooking sugar snap peas: To make this recipe really quick and easy, we usually grab a microwavable 16-ounce bag of fresh Green Giant steam-in-pack sugar snap peas (although I often use a slightly shorter cooking time than specified, so our peas are hot but still really crunchy and don't have that overcooked-pea flavor). 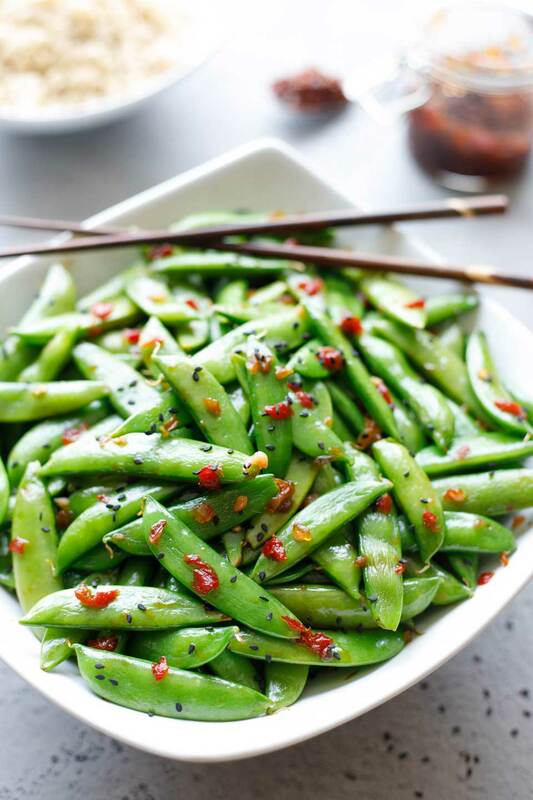 Feel free to use fresh sugar snap peas from your garden or farm market instead – and to prepare them however you prefer (steaming, stir-frying, etc.). Combine 1½ teaspoons seedless red raspberry jelly (preferably all-natural or pure-fruit) with ½ teaspoon chili garlic paste (such as Dynasty brand). Whisk them together until they're smoothly combined, and use that to replace our recommended 2 teaspoons Pepper Relish in this recipe. Make-ahead tips: This recipe is a terrific make-ahead and works well for meal prep. 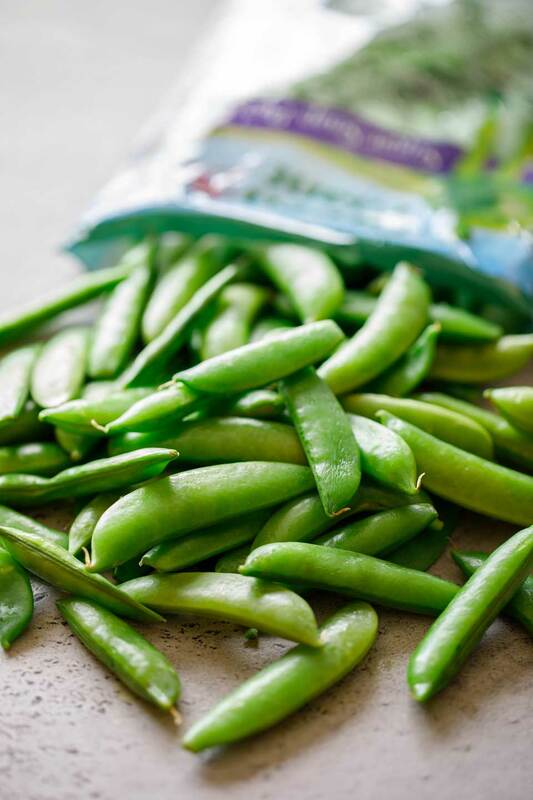 These sugar snap peas are delicious chilled and only get better as they sit. They also reheat well with just a gentle reheating (so they don't get that mushy-pea flavor). If you know that you're planning for leftovers and will be reheating them, then definitely be careful not to overcook them initially, so they're still fantastic when you rewarm them later. What a delicious easy recipe. Love the colours and flavors. I can’t wait to try this. I bet that my whole family will love it. These look so good! I could eat them for snack everyday this week! I love asian flavors so I know that I will love these! Yum!! What a great snack or side dish! I’d love to try these without the spicy to see if my toddler would eat them. I know I would, I love anything with toasted sesame oil on it! These look perfectly cooked – still with a slight crunch and gorgeous color! I would love these served with a nice grilled salmon steak! Oh yum! 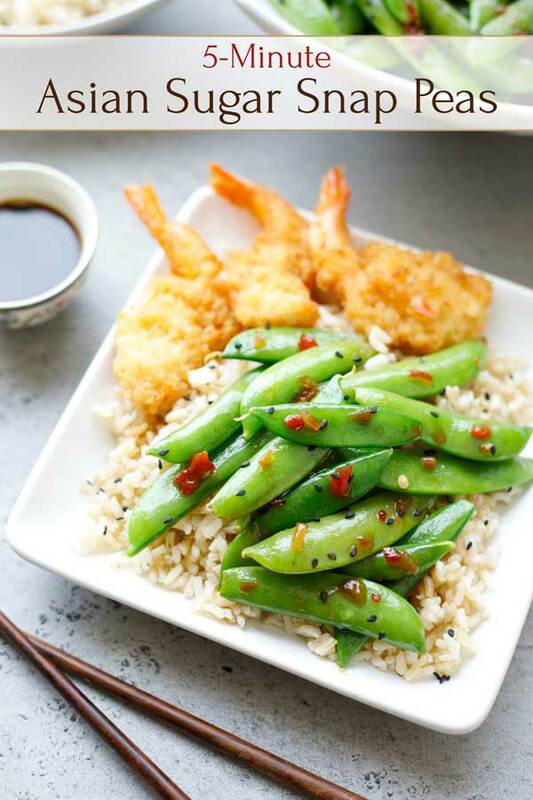 Those sugar snap peas are gorgeous! What a lovely side dish. Would love to have them over rice with some tempura shrimp! SO good! You can never have enough quick and easy weeknight sides in your back pocket. 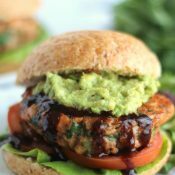 This is definitely one I need to try, along with that sweet and spicy pepper relish! Total winner, right here! Such a simple yet flavorful side! These look wonderful ^_^ I love your site btw…everything looks so beautiful and delicious! Love how simple and delicious this is. Snap peas are one of my favorite. Will soon try your version. LOVE THIS! I have tons of pepper relish and I needed ideas on what to use it on. This is brilliant. I can’t wait to try this recipe. I am so excited.